Our Colour Roll Lip Glaze Trio is a must-have for any makeup fan looking for a pop of on-trend colour this season! Enriched with argan oil, vitamin e and plant polymers, these sumptuous lip glosses, available in three beautifully wearable shades, look amazing while nourishing and protecting your lips! The long-lasting, smooth texture of these lip glosses makes them the perfect pout partner! At £28 for all three shades, you’ll save £14 when you buy our Lip Glaze Trio so why stop at just one! 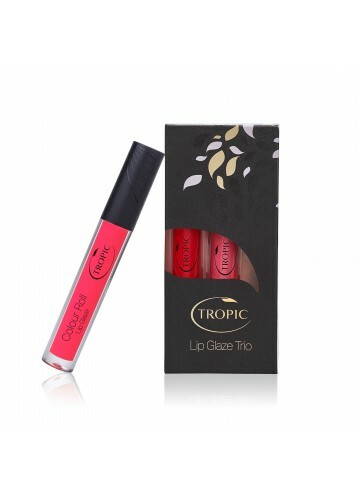 Categories: Cosmetics | Tags: colour roll lip glaze, natural cosmetics, natural make up, tropic cosmetics, tropic lip glaze, tropic make up, vegan cosmetics | Permalink. May is our Be Beautiful month! Order your Beauty Booster Serum today! Many traditional BB’s are labelled ‘creams’ and have a thicker, tinted moisturiser quality to them. Tropic wanted to go a step further so we created the Beauty Booster ‘Serum’. What’s the difference? Well the molecules in a serum are much smaller than those in a cream so can deposit ingredients deeper into the skin which is always a huge bonus when it come to making a visible improvement to your complexion! With so many incredible plant and mineral actives ready to work their magic on your skin, these smaller particles are a huge benefit of a serum-based BB. If you need further reasons to be pro serum, the smaller molecules also give your BB its silky, effortlessly, gorgeous, weightless finish and ensures you achieve a smoother, more even application. Our BB also has a natural SPF of 20. Categories: Cosmetics | Tags: against animal testing, Natural BB Cream, natural mineral cosmetics, Tropic Beauty Booster Serum, vegan cosmetics | Permalink. So, we’ve done ‪#‎detoxjanuary‬. Now its time for ‪#‎flawlessfebruary‬! This February is all about looking and feeling flawless! There’s nothing you can’t achieve when you’re feeling your best. We’ve all spent January detoxing our skin so we’re all glowing, fresh and ready to take on the world. Now it’s time to achieve skin perfection with the lovely lightweight, nourishing foundation collection. The Flawless Complexion Gift Box (£49) is the best-selling collection in our make-up range. With a huge saving of £37 it’s a total winner! So what’s inside the Ingredients? levels of caffeine. In fact these seeds contain almost twice as much caffeine as a coffee bean! Contrary to what its name suggests, Sea Buckthorn oil does not come from the sea. It’s actually derived from a shrub that grows in the mountainous and coastal areas of Asia and Europe. It is known as the “tree that makes the horse shine,” referring to its ability to improve horses’ health and make their hair shiny and smooth. Sea Buckthorn has a long history of use in folk medicine, dating back thousands of years and is well-known today for its healing and rejuvenating effects on the skin. 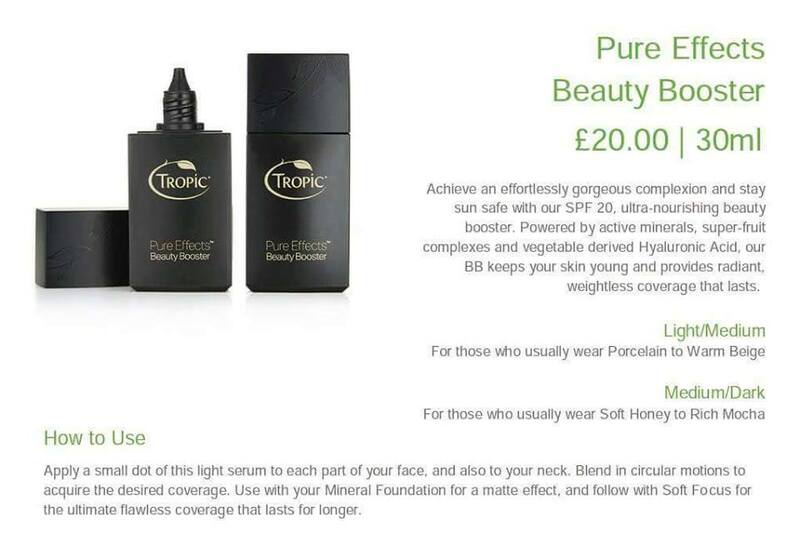 Tropic use this lovely ingredient in your Mineral Foundation to reduce the signs of ageing whilst nourishing and protecting the skin. Guarana. Along with its brightening effects and circulation boosting powers, the caffeine in Guarana has been shown to constrict blood vessels which helps improve the appearance of dark circles, and reduce the swelling and redness of spots! And the very special fact about our Mineral Foundations is the Spherical Technology! All your Mineral Foundations, Warm Glow and Soft Focus use spherical technology to give a super silky application and diffuse light for a flawless, even finish every time! Flake (mirror reflection) – Selective reflection of light from the front. Flake shaped particles adhere to the interior of wrinkles and skin imperfections, and as a result they only reflect light from the front. This one directional reflection is not very effective at concealing wrinkles. Sphere (diffusion reflection) Diffuse reflection of all light evenly. Spherical shaped particles reflect light in many different directions therefore diffusing the light evenly and smoothing out the appearance of wrinkles. 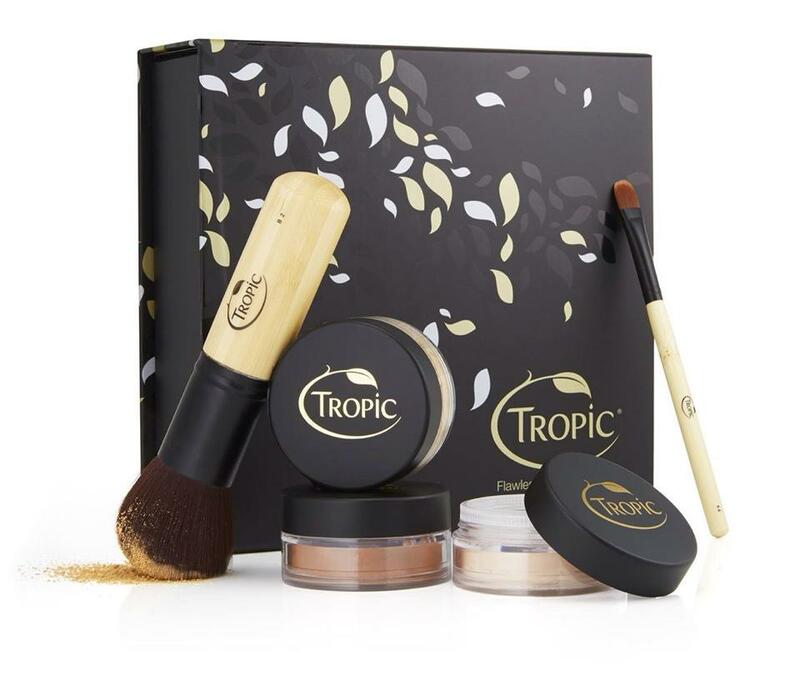 Categories: Cosmetics | Tags: flawless complexion kit, natural mineral cosmetics, tropic mineral foundation, vegan cosmetics | Permalink.